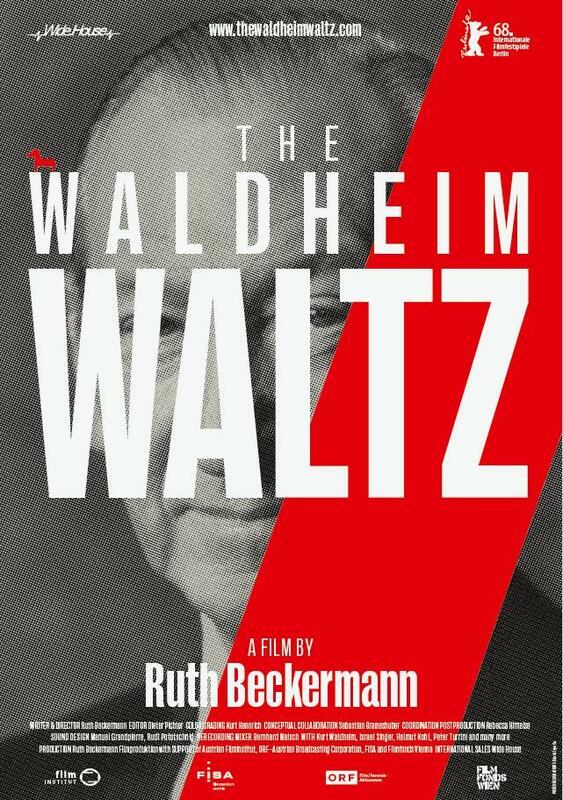 Given the time line shown us in THE WALDHEIM WALTZ -- from World War II onwards into the 1960s through the 1990s -- it is little short of amazing how riveting, galvanizing and particularly timely this new documentary about Kurt Waldheim proves to be. 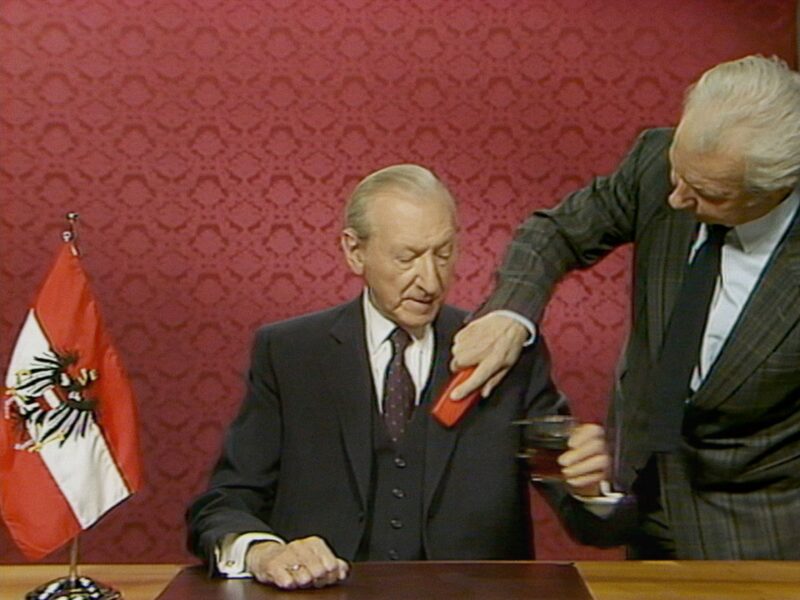 Herr Waldheim is the fellow who famously served as Secretary-General of the United Nations from 1972-81. 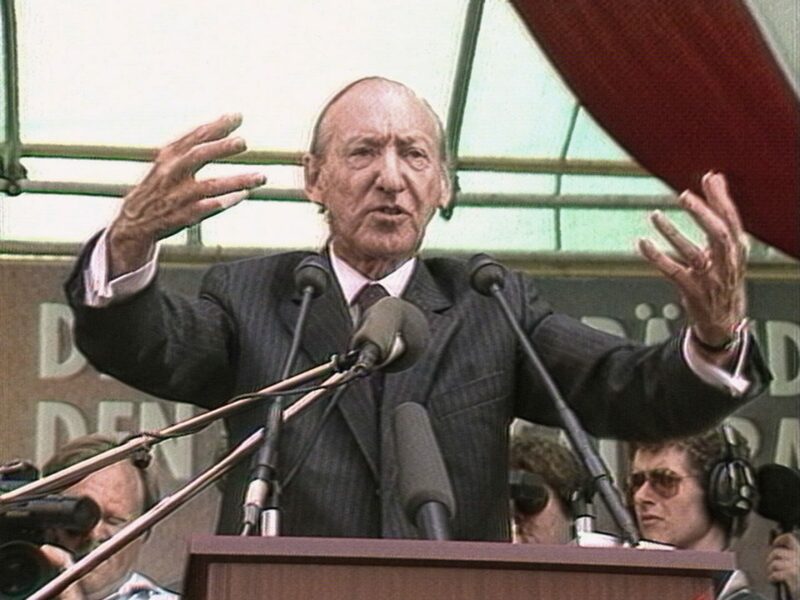 Though rumors had begun circulating about his Nazi past even then, they became a full-fledged scandal once he ran for President of Austria, first in 1971 (he lost) and then again in 1986 (he won). (shown at left) -- takes us back to the protests that rocked the western world during these events (which we see below and further below), even as we meet Herr Waldheim and some of his family members and take note of how he handles and deflects the charges against him -- one of which involves how his famous biography so clearly lies regarding his Nazi past. His "excuses" (see the photo at bottom) are revelatory. 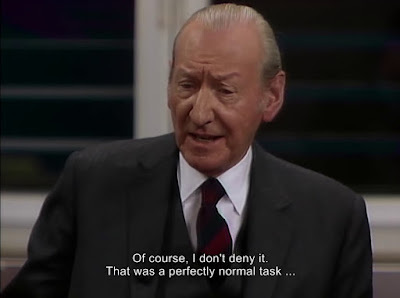 While one should never allows a single man to represent his country, you may find it difficult not to do this where Kurt Waldheim is concerned. 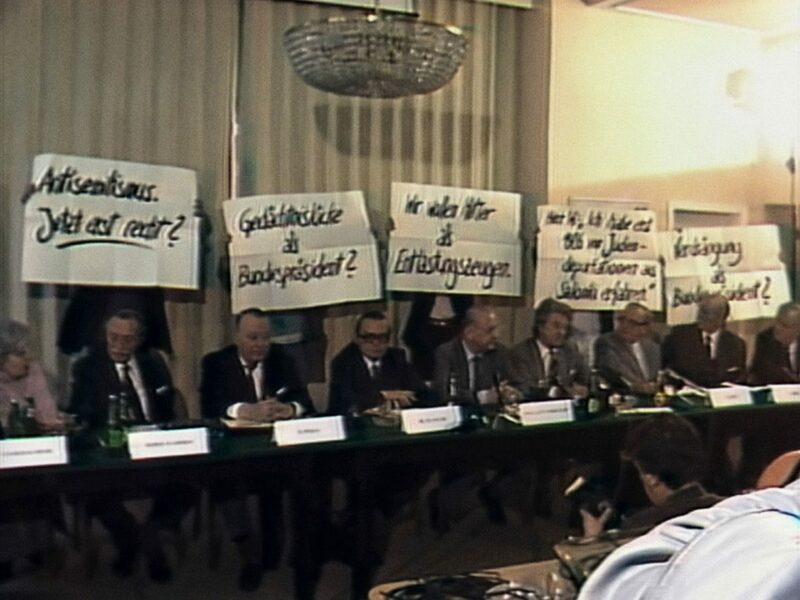 As the movie, along with some of its interviewees, points out, the country of Austria (unlike that of Germany) has never taken responsibility for its role and actions during World War II. Instead it sticks to its own ridiculous theory about being WWII's "victim." Listening to all this "hooey" may put you in mind of what went on during our own recent Brett Kavanaugh hearing. The American Republican Party has been using this "victim" ploy for decades. Now it just grow worse and ever more stupid for those of us not doing the Republican "goose step." Ms Beckermann's movie is filled with terrific archival images, as well as precise and germane interviews that fill us in on what went on during this time. 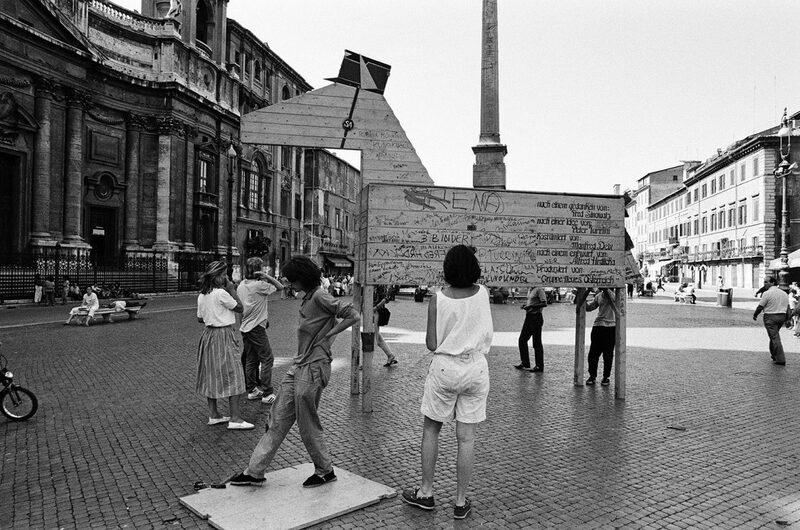 All is woven together with such skill (the editing is by Dieter Pichler) that the documentary's pace never slows but only grows, as the sense of impending doom begins to engulf us. Though folk who follow history will already know what happened, Beckermann makes it current and horrifying all over again. If you find yourself wondering how a population could manage to elect someone like Waldheim (above and below) who had been so thoroughly discredited, over and over again prior to his election, you only need to think of the USA and Donald Trump. And in fact, if you follow world politics, you'll know that right-wing parties won first place and third place in Austria's national election only last year. Ms Beckermann does not ever mention this in her fine documentary. 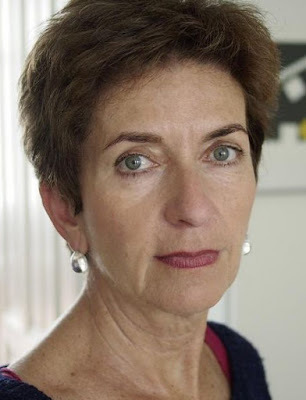 For Austrians, she doesn't need to: history simply repeats, and too many of them are happy to go with the flow. One caveat: TrustMovies wishes that the filmmaker or distributor had invested in better English subtitles. Those white ones used here are sometimes very difficult to read against the various white or light grey backgrounds. From Menemsha Films and running a sleek 93 minutes, The Waldheim Waltz opens this Friday, October 19, in New York City at the Metrograph. In the weeks to follow, it will hit other scitires around the country, including Los Angeles (at Laemmle's Royal and Town Center) on November 16. To view all currently-scheduled playdates, cities and theaters, click here.